We here at WalletPop have explored the practices -- and the pitfalls -- common to retail-branded credit cards in the past. As we've told you, one of the biggest problems with these cards is the 20%t-and-up interest rates many of them carry. While this is bad news for consumers, new research shows that it's only getting worse. According to a study conducted by CreditCards.com, half of three dozen store cards surveyed this summer had hiked their rates since 2009. Among store credit cards, there are two types: Co-branded cards, which carry the name of a network provider like Visa or MasterCard, and non-co-branded. Between the two, cards that aren't co-branded tend to come with higher rates. Of the cards studied, 19 of them had interest rates of 23% or higher. Only 11 had rates that high when the site last looked at retail cards back in the summer of 2009. The highest rate out there? That would be the Best Buy credit card, with a whopping 27.99% interest rate. Home Depot and regional chain Meijer weren't far behind, both with rates of 26.99%. "It has significant impact on a consumer's budget," says Sheri Flanigan-Vazquez, chief operating officer of Justine Petersen Housing and Reinvestment Corporation in St. Louis. "In many ways it pushes them to get those cards paid off sooner which is something we always encourage our clients to do, to use those cards not to consume but to build good credit," she told WalletPop in a phone interview. While some people lay the blame for these skyrocketing rates at the feet of the CARD Act, that's not entirely the case. What the CARD Act did was reign in abuses such as interest-rate hikes after you'd already accumulated a big balance. Now, these APRs are painfully high, but at least you know what you're getting into at the outset. 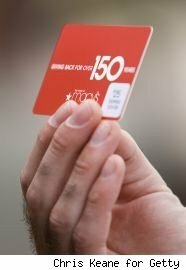 The high interest rates for many store cards is one reason why experts recommend avoiding them unless you're positive you can pay off your balance every month. Even the savings you could get from the coupons or discounts these cards frequently offer customers pale in comparison to what you could be spending in interest fees if you don't pay off your cards in full every month. Flanigan-Vazquez recommends avoiding the trap of high APRs by purchasing only items with your store cards for which you already have the cash so you can pay off the bill in full when it arrives.